Sunday’s $350,000 Championship at Sunland Park (Grade 1) starring 2016 World Champion Quarter Horse Jessies First Down will be one of 6 rich stakes races presented at Sunland Park Racetrack this weekend. The 17th running of the Championship at Sunland Park anchors the mega New Year’s Eve weekend as Sunday’s 11th race going 440 yards. Jessies First Down has been virtually unstoppable all year and is a chief threat to repeat as the 2017 World Champion running Quarter Horse. The roaring son of Fdd Dynasty has reeled off three straight wins in the $150,000 Zia Park Quarter Horse Championship, the $250,000 Downs at Albuquerque Fall Championship and the $200,000 All American Gold Cup where he defeated Zoomin Effortlessly. His only defeat this year was a photo finish loss to Zoomin Effortlessly in the Remington Park Invitational Championship. He has won 5 of 6 races in 2017. His immaculate career record stands at 15 wins, 11 seconds and 1 third from 33 starts with earnings topping $1 million. Jessies First Down beat Zoomin Effortlessly by a thrilling nose in last year’s Championship at Sunland Park. He is the pride of owner Ted Abrams and could go down in history as one of the all-time great Quarter Horses. Rodrigo Vallejo is his regular pilot. 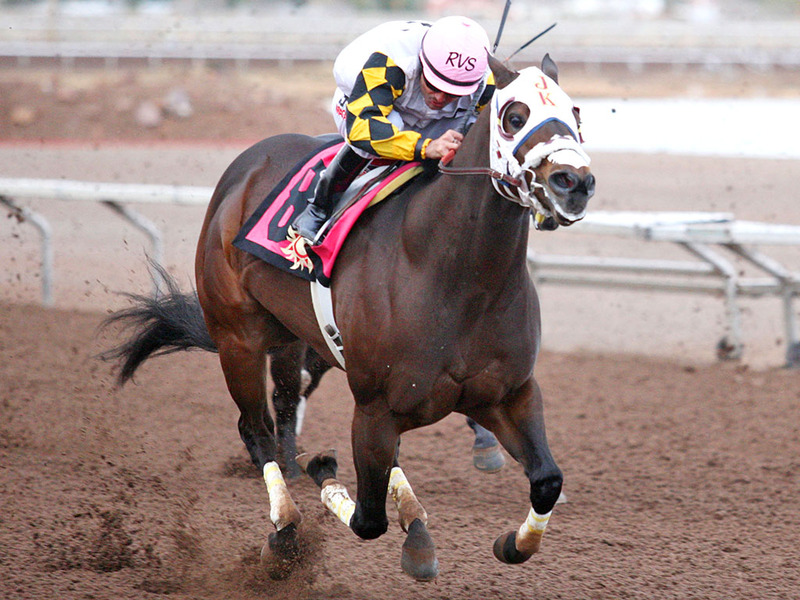 Sunday’s 10th race is the $200,000 Sunland Park Winter Juvenile Championship at 400 yards. The razor sharp filly Apollitical Brooke leads the group of freshmen coming off a win in the $200,000 Southwest Juvenile Championship at Zia Park. 2017 West Texas Futurity winner Suenos Dineros is also in the field. The two Thoroughbred stakes on Sunday are absolutely first rate. The $65,000 Bold Ego Handicap (9th race) at 5 and 1/2 furlongs lures the fastest females into action. The recent New Mexico Racing Commission Handicap winner Tilla Cat and her classy multiple stakes winning stablemate Diabolical Dame will be running for trainer Todd Fincher. Leading Sunland Park trainer Justin Evans counters with the exceedingly tough Game Time Decision who already has a local win this meet and was second to K P Wildcat in the Zia Park Distaff. 2017 Sunland Park Oaks runner-up Kell Paso helps strengthen an already deep field. Steve Asmsusen is sending the fast closing One True Kiss while Neil Drysdale is represented by the fast Little Dume from Turf Paradise. Todd Fincher will saddle the outstanding New Mexico-bred two-year-old sensation Kris Who in the $85,000 Four Rivers/John Deere Stakes (8th race) at 6 furlongs. Kris Who pummeled his rivals at Albuquerque by winning the New Mexico State Fair Thoroughbred Futurity by over 6 lengths. Alfredo Juarez, Jr. returns to ride the highly anticipated 3-time winner. Joel Marr’s Indian Jack is coming off a lucrative win in the $140,000 Eddy County Stakes at Zia Park. Hollywood Henry deserves respect trained by Henry Dominguez. Saturday’s card is bolstered by both the $85,000 La Senora Stakes (9th race) at 6 furlongs and the $85,000 Lou Wooten/Sydney Valentini Handicap (10th race) at 400 yards. The unbeaten stakes winning filly Fast Gator should go favored in the La Senora. Trained by Henry Dominguez and owned by Kirk and Judy Robison of El Paso, Texas, Fast Gator is a perfect three for three. She holds rousing wins in the New Mexico Cup Lassie Stakes at Zia Park and the Rio Grande Senorita Futurity at Ruidoso Downs. The Diabolical filly should control the pace under red hot jockey Ry Eikleberry who won 4 straight races here on Saturday, Dec. 23. Maiden winner McGoldie races for the Judge Lanier Racing Stable led by Tom McKenna. Stakes placed Movin On represents a threat from trainer Joel Marr. The champion New Mexico-bred mare Princess Jesse returns to defend her title in the Lou Wooten/Sydney Valentini. The Mikkelson Racing owned star will be seeking her 9th career win. The winner of over $340,000 will square off against heavy hitters like Shue Fly Stakes winner Running Dragon, Mesilla Valley Speed Handicap winner Carson City Girl and the stakes placed filly Princess Jessie Jane. Live racing starts at 12:30 p.m. on Friday, Saturday, Sunday and Tuesday.